We departed from Xi’an on the 13th of January and it already seems like eons ago. We have done and seen so much in just over a week and there is so much to tell you, so below is a short overview of our travels so far. We made it to Kuala Lumpur via Shanghai with no interruptions whatsoever and were greeted by a lovely temperature in mid 20s and the humidity that goes with the tropics. As we arrived at 1am, we took a taxi to a hostel, where we had a few hours’ sleep. In the morning we discovered that our hostel was right in the middle of KL’s China town, so we had gone from China to China town. We had a day in KL, so we set off to explore the city a little, but our aim for the day was to purchase an Indian wedding outfit for David and a couple of shalwar kameez for me. We were very successful on both occasions. From the very little that we saw, KL seemed to be a very pleasant place to live in. The Muslims, Hindus, Buddhists and Christians all seem to live quite peacefully, but from what it seemed to us, they tend to stay in their own communities and don’t exactly love each other, yet there is no blind hatred either. 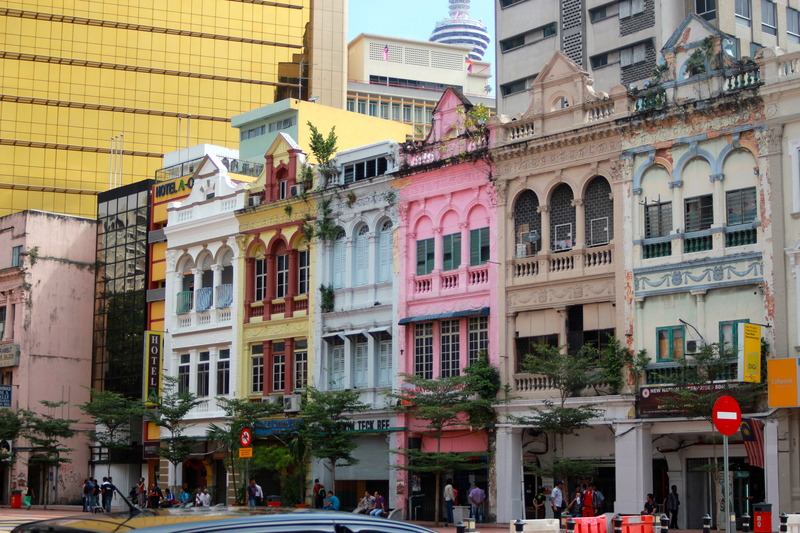 KL itself has a rich colonial history, which was very apparent in the European architecture seen throughout the city. We only caught a glimpse of the famous Petronas Towers on our way to the airport. After a little walk and Malaysian Kopi Susu (local coffee served with condensed milk) around our hostel we headed to an area called Little India, which is exactly what the name says. 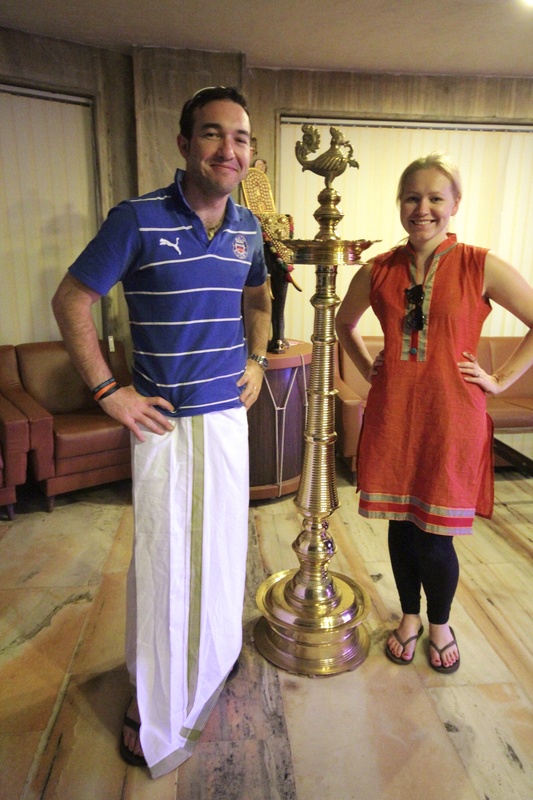 We bought our clothes, had lunch in a south Indian restaurant and headed back to the airport, ready for India. We arrived in Kochi airport very late in the evening and were met by a driver, who took us to our hotel in Thrissur, which is a city of about 300,000 people and known for its many festivals. As soon as we got out of the airport we saw an elephant on a truck. Elephants soon became such a usual sight, that we didn’t even bother to turn our heads to look at them. I had arranged us a few places to see as we had a couple of days before the wedding festivities started. So early the next morning we set off for Munnar, which is a hill station surrounded by tea and spice plantations. 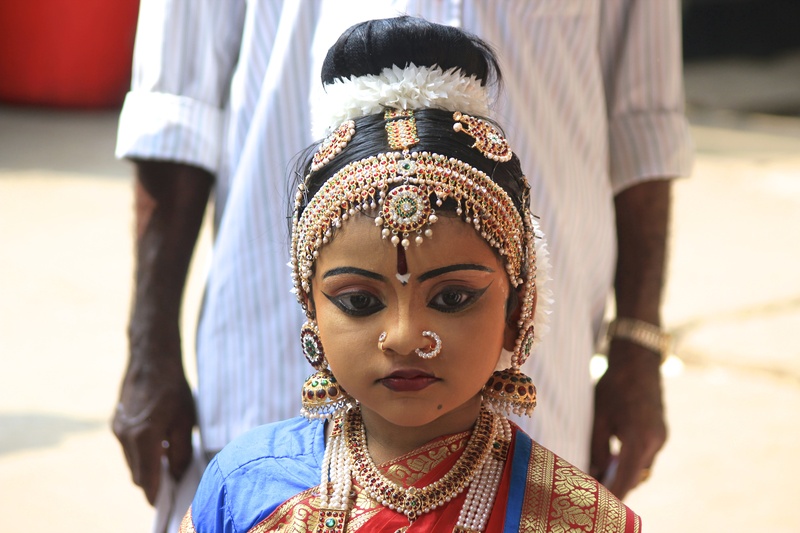 Keralan people are mostly Malyalis and so speak Malyalam as their first language. Malyalam is known as the French of India as it sounds very melodic, but it is absolutely nothing like Hindi or any other language I had ever heard. There are a lot of ‘r’ sounds and it seems like there is no break between the words. The Malyali people we found utterly charming, friendly and wonderful. 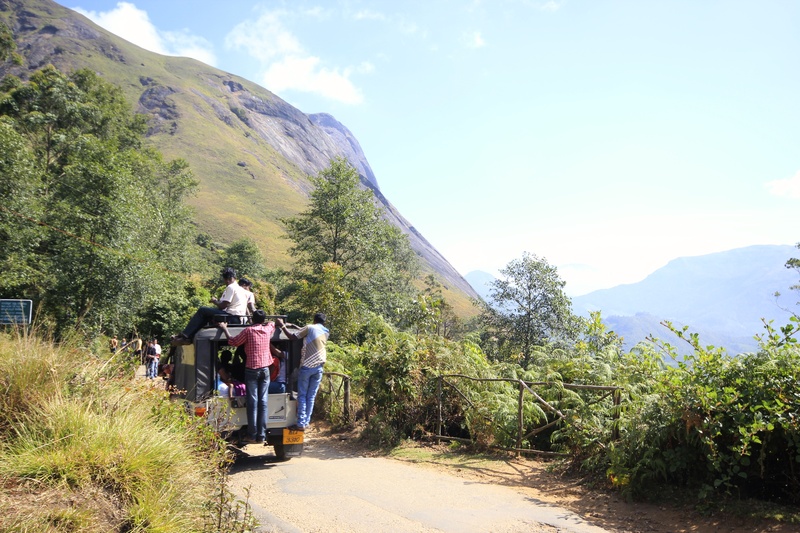 They would always greet us with a smile and a welcoming headshake and try to talk to us using a mixture of Malyalam, Hindi and English. Our driver, Sandeep, spoke very little English and Hindi, but he had been working in Saudi Arabia and learned some Arabic there, so David and him managed to get by in Arabic and sign language. 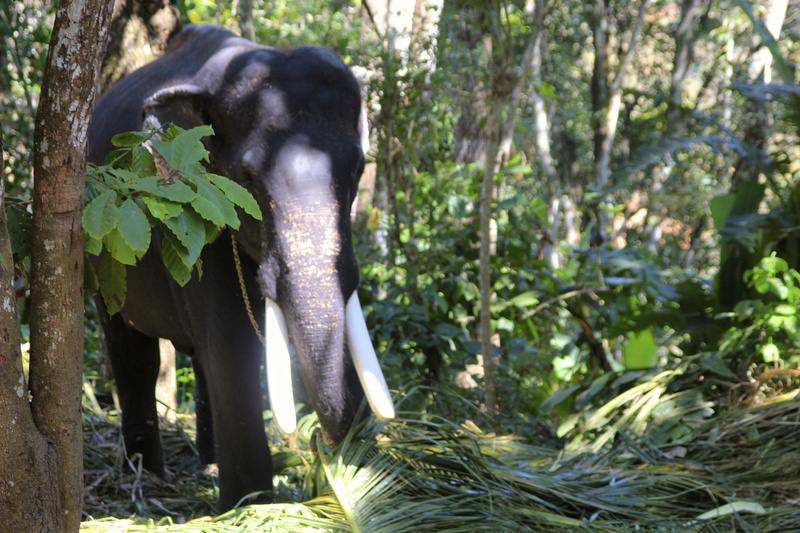 As we climbed the mountains on the broken curvy roads we passed an elephant sanctuary, so we of course went in and rode an elephant. 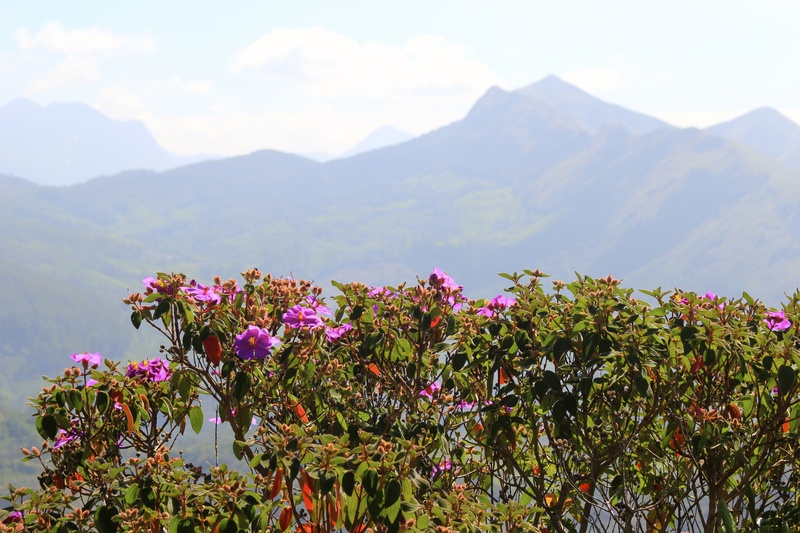 The climate in the mountains is ideal for growing spices, so we went to see a spice plantation, where they grow coffee, cardamom, vanilla, turmeric, pepper, cloves, nutmeg and so on. We were shown around by a nurse, who quit her job and now works at this plantation, because it pays more. 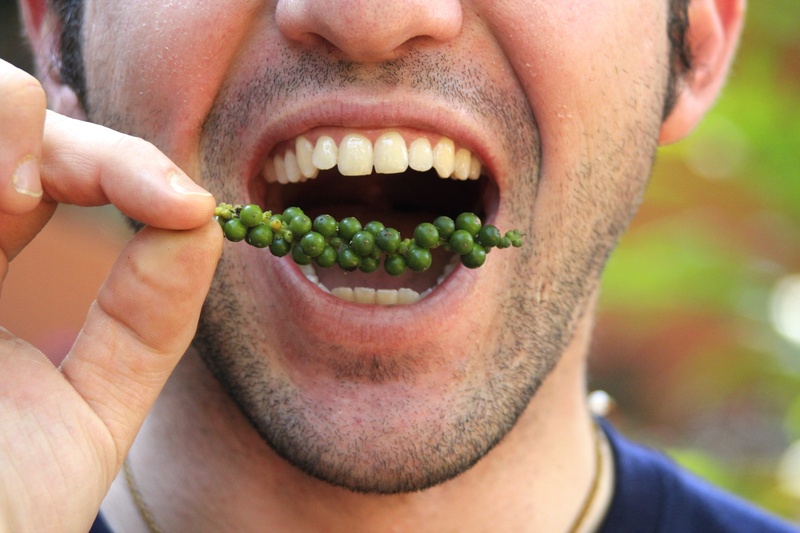 David sampling some fresh pepper. 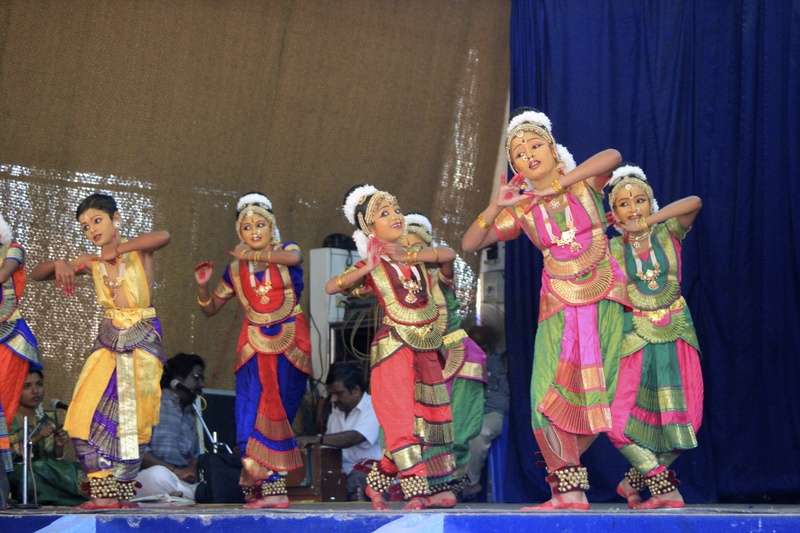 We went to see a kathakali show in a little village we passed through. 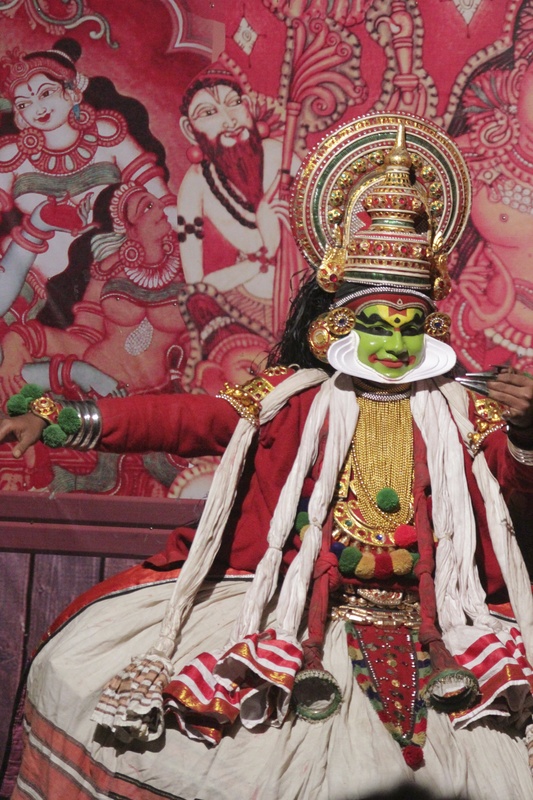 Kathakali is and ancient form of theatre in Kerala, where intricate costumes and make up is worn and all communication is done via facial expressions. We finally reached our hotel having spent 9 hours in the car. David was feeling quite ill by that time, so he went to sleep and I immersed myself in the delights of using the internet without a VPN and watching news that report things from other perspectives than the Chinese. Background music to all this was the birdsong coming from the mountains outside our balcony window. 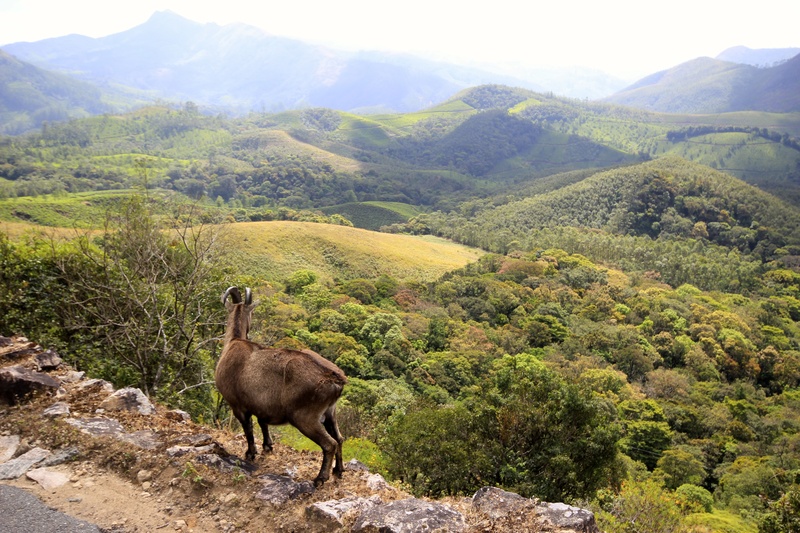 The next day we visited the Eravikulam National Park, which is one of the few places where one can spot the Nilgiri Thar, which looks like a large mountain goat. 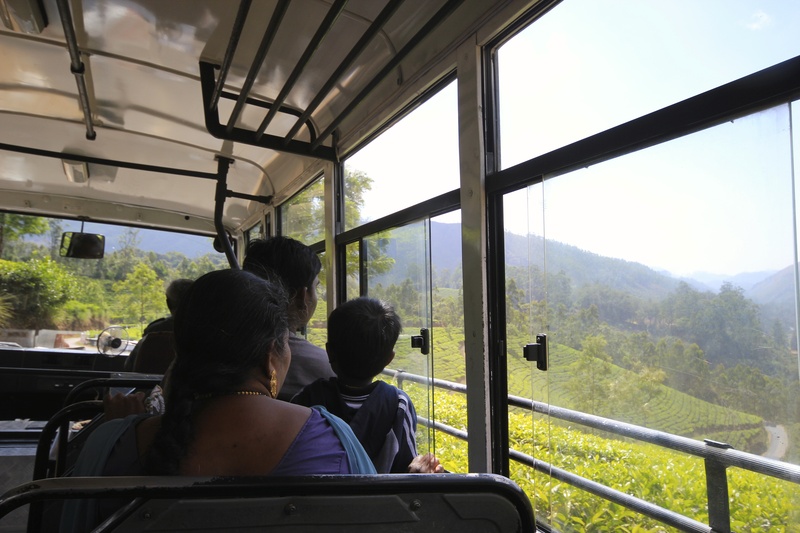 We were taken to the national park on a rickety old bus, which turned the corners thinking itself a Ferrari. We went for a walk in the park, but were often stopped by groups of people who all wanted to take photos of us. I decided to be lazy and say we are both from Zimbabwe as it was more likely that people would know Zimbabwe, being another cricket mad country. 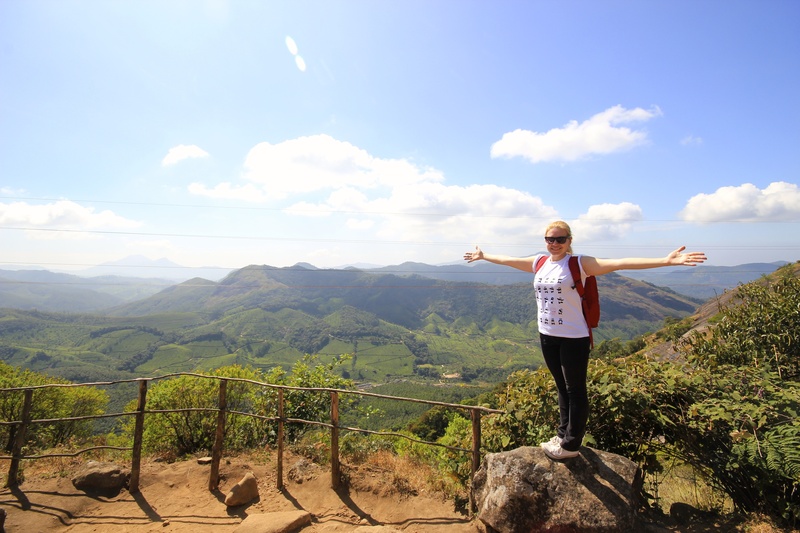 The views that opened up from those hills were breath-taking – kilometres of tea bushes, tropical birds flying around the colourful flowers and shrubs, friendly smiling faces everywhere and goats eating grass on the hillside. We visited a tea factory on our way down. The factory was established by the British and been there for at least a 150 years. We were shown the process of drying and cutting the tea leaves and we ended the tour with a nice cup of tea. 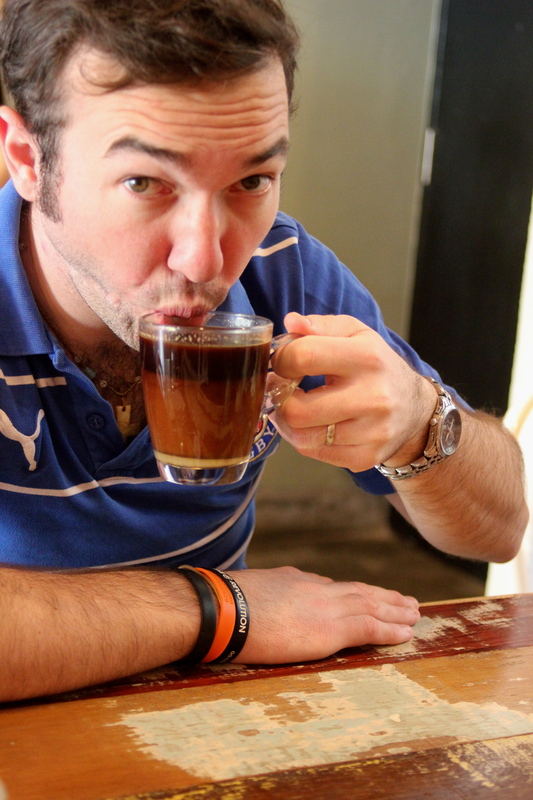 The tea here is nothing like what they drink in the UK. It’s a lot stronger, milkier and sweeter and a lot tastier. We get cups of tea wherever we go and there are tea stands all over town. A cup will cost about 7 rupees, which is about 7 pence. 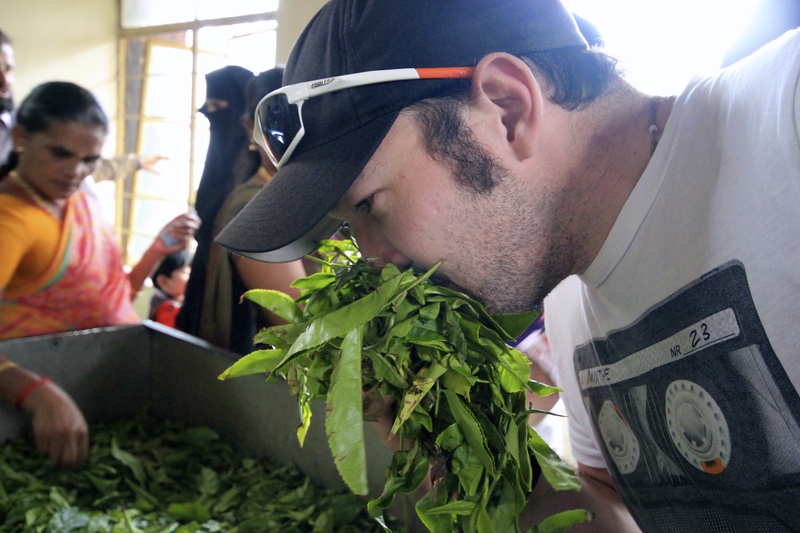 David sniffing some fresh tea leaves. 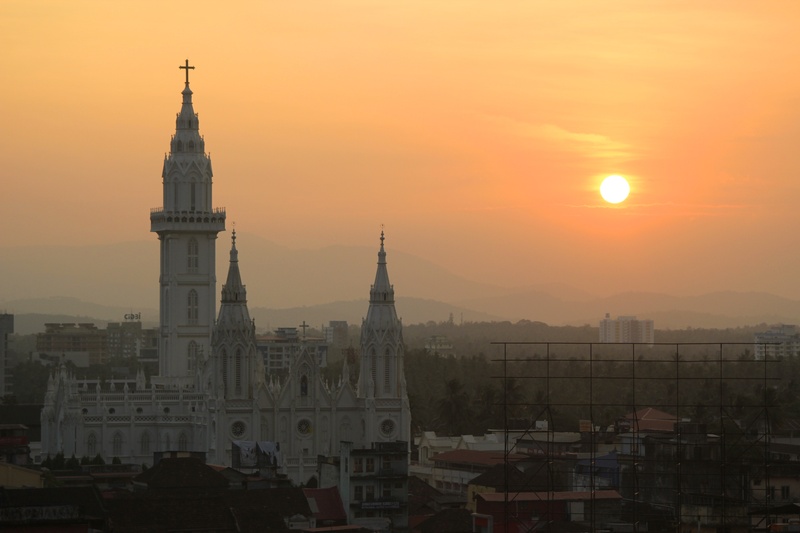 There are two interesting things we noticed about Kerala – the state is mostly Christian and it is Marxist, both of which seem to work very well for them. 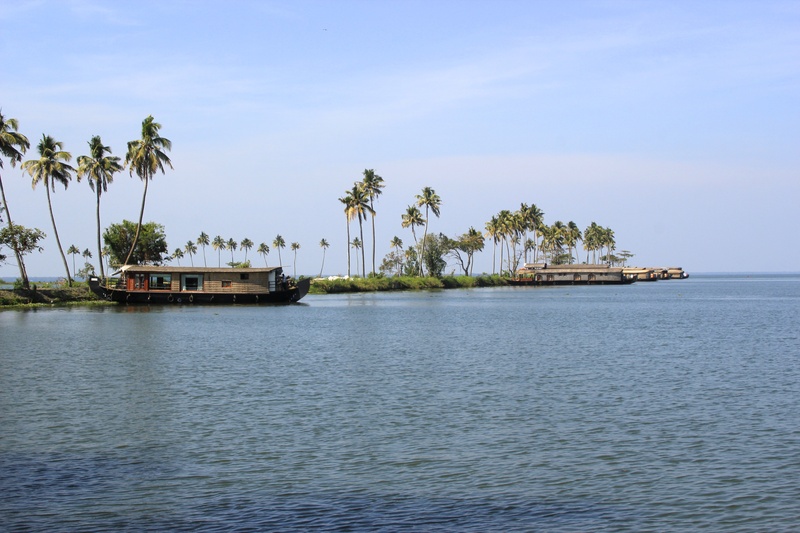 Christianity arrived in Kerala as early as 52 AD with Saint Thomas, but the presence of it was strengthened and institutionalised a lot after Vasco da Gama found a sea route to India. The biggest denominations are Catholic and Syrian Orthodox Churches. Kerala is one of the richest states of India and I believe the Christian missionaries have helped this a lot by building schools and investing in infrastructure. The odd thing is how different the church in Kerala seems from the usual Catholic or Orthodox churches we are so used to seeing. 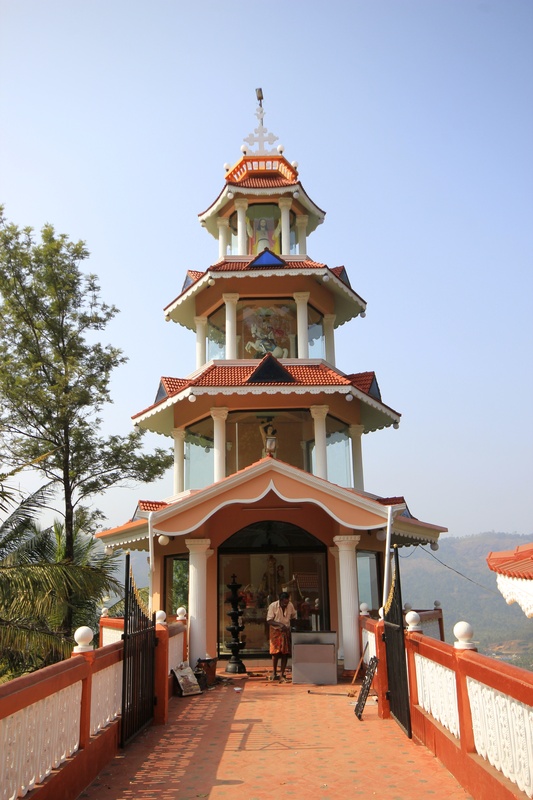 There are somethings like shrines dotting the roadsides with statues of Jesus, the Pope, Virgin Mary and numerous saints topping large structures. The buildings are often decorated with lights and ribbons and are very over the top. They often reminded me of Hindu temples rather than Christian churches. 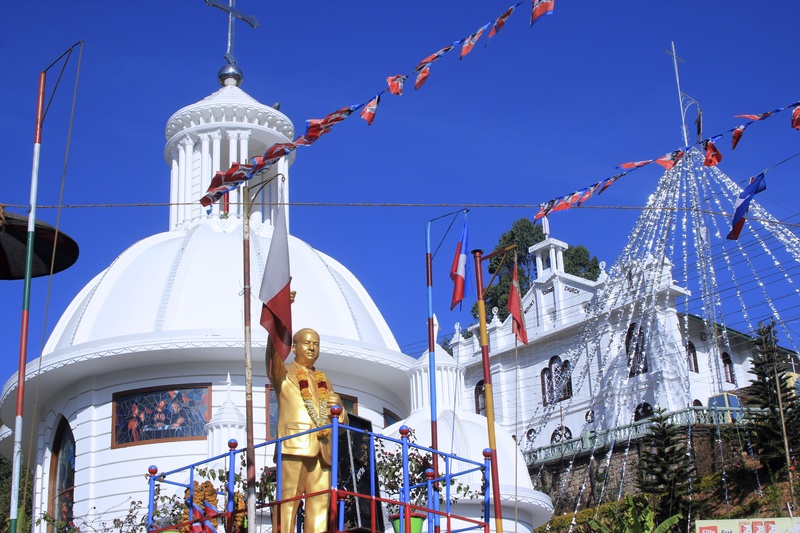 The locals have incorporated their culture to church and I think this is a great way of keeping the local culture and traditions live while introducing something new. It is remarkable that these churches stand next to Hindu temples and mosques and there are shops in between all three selling rosaries, prayer mats and pictures of Ganesh. Everyone we asked about this told us that people are free to choose whatever they want to believe in and nobody will look at them twice if they call themselves a Hindu and Christian at the same time. As there are many gods in Hinduism, Jesus is sometimes just seen as another one. It all felt very unforced and people seemed to be happy to be living together and sharing their resources despite believing in different gods. The Marxist part was visible in hammer and sickle flags and party meetings being held by the side of the road. As they were all held in Malyalam, we could not understand what was being said, but people from the village could go along and ask their leaders questions and make complaints. Again, this seems to work for Kerala, which has one of the highest literacy rates in India, achieving a 100% in some villages. 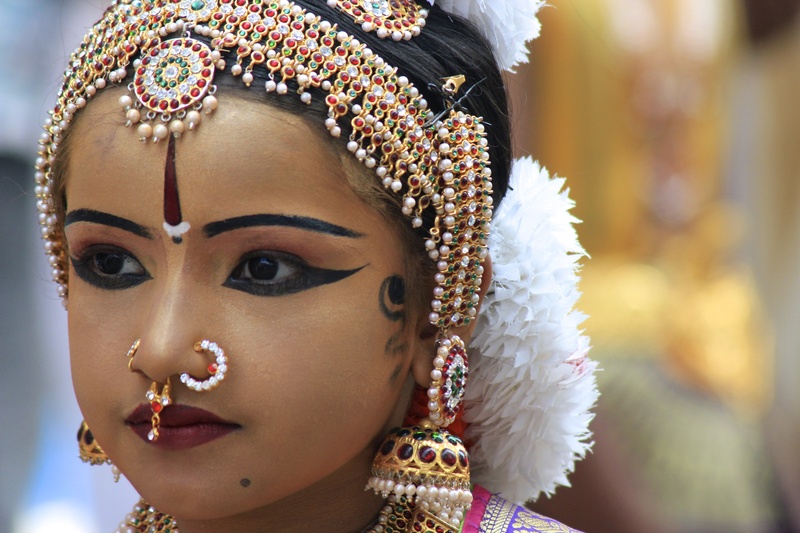 Thrissur is quite a small city by Indian standards and not a lot happens there unless it’s festival season, which commences in February. We found it a very fascinating place anyway and explored the city’s streets taking in all the sights which comprised food vendors, elephants in parks, kids playing cricket, people sitting on the road and sipping sweet tea. 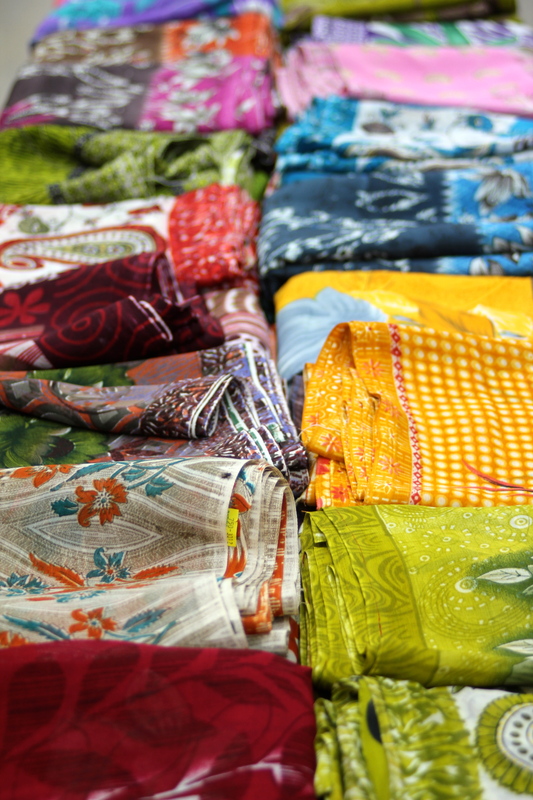 Keralan men wear a mundu, which is a piece of cloth wrapped around the waist. I was a little shocked when we went out at night and saw tens and tens of homeless people sleeping on the pavement, all lined up next to each other to save space. However, I did not feel unsafe once. The view over Thrissur from our hotel. 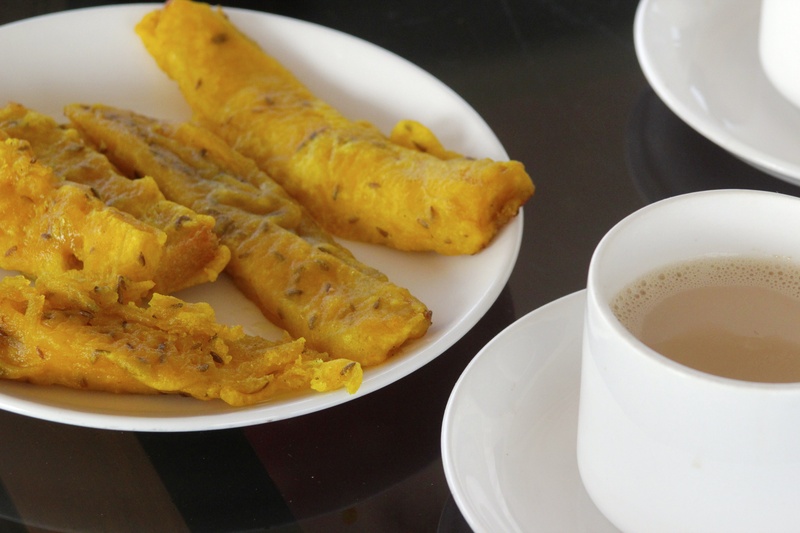 The food in Kerala is quite different to the Indian we are used to in the west. A lot of coconut and tamarind is used in the local dishes, which are mainly vegetarian. There are umpteen options of fresh fruit juices and vegetables I had not even seen in China. 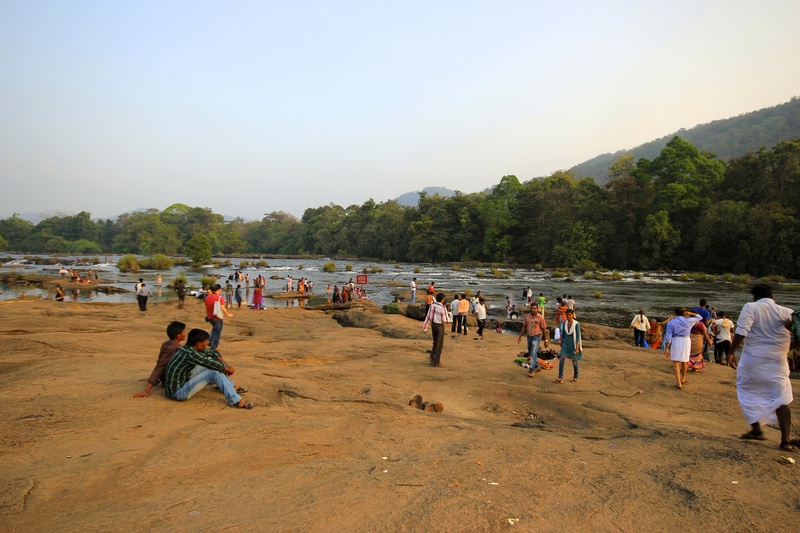 We also ventured outside the town to admire some waterfalls, where we found hundreds of people cooling down in the river, playing and doing their washing all at once. 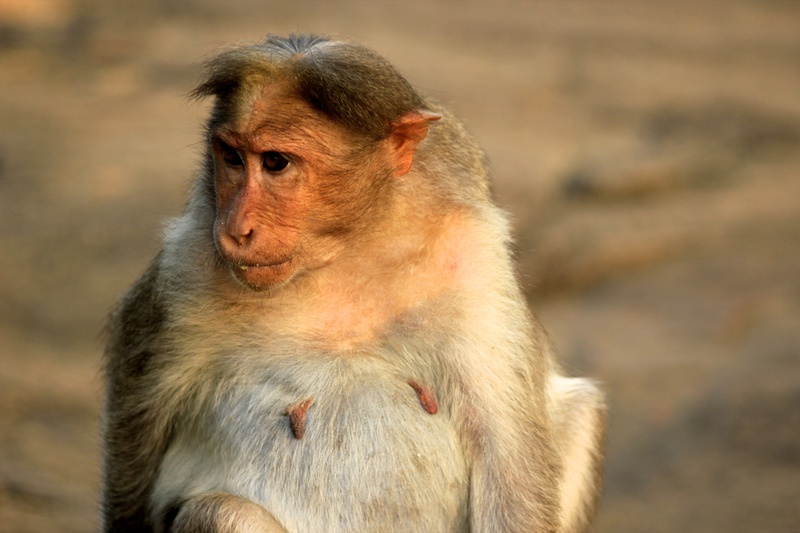 The place was teeming with monkeys, who were keen to steal anything left loose. I was very popular with the local guys, who all wanted to take photos of me and shook my hand afterwards to say thank you. Blonde life in India is not easy. Attention to the monkeys behind us. 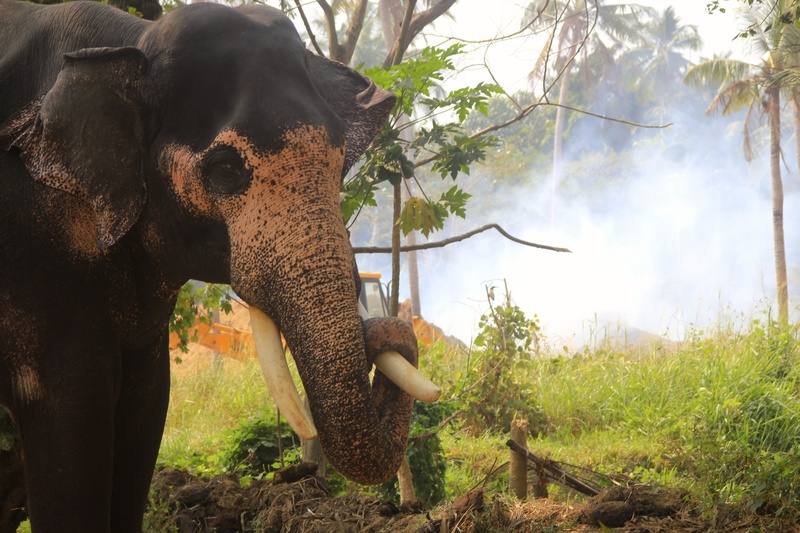 We visited the world’s largest elephant sanctuary, which looks after injured elephants and temple elephants. 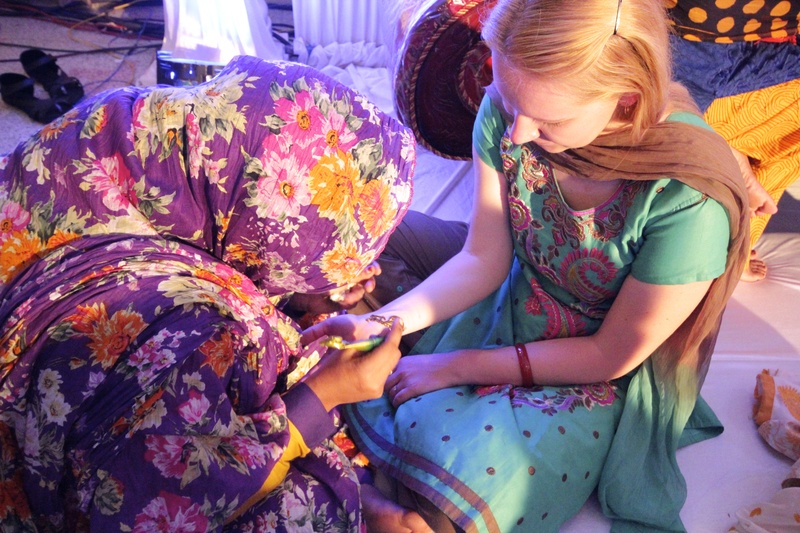 As you all know, the main reason we went to India at this time was to take part in one of my university friend’s weddings. There had been many celebrations and functions before, but this was the first one to be held with close friends and family. 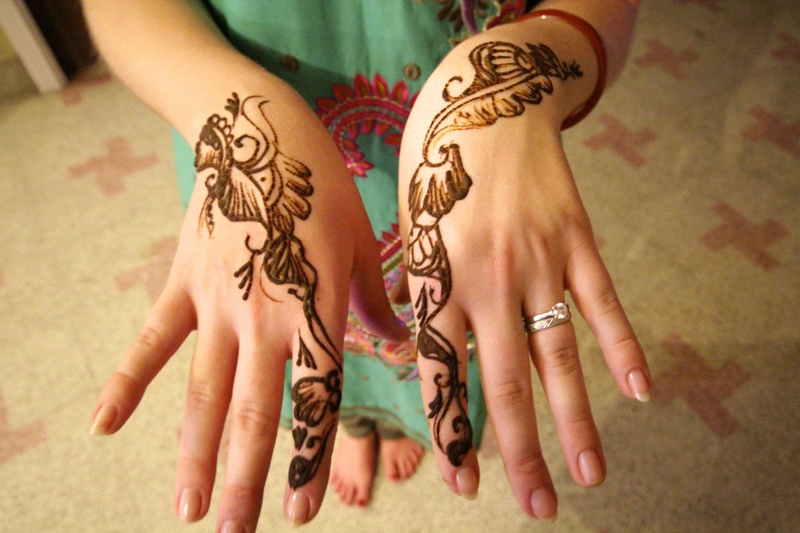 Mehendi is an evening for girls where they get henna (mehendi) put on their hands and serves like our hen do while sangeet is the groom’s stag do in essence. These two are usually held separately, but on this occasion it started as one event. As the bride comes from a matriarchal society, the wedding was held in her mother’s hometown and the groom was introduced to her family during this evening. Poor guy will have a very hard time remembering all the names and who’s who. At first the parents and siblings of the bride and groom each lit a light on a special lamp. 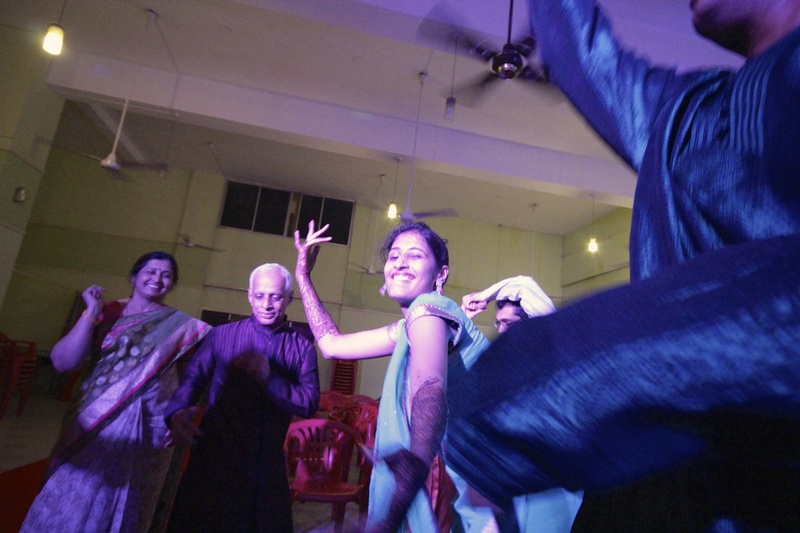 Then some relatives from both sides recited poems, sang songs and danced for the happy couple. The bride also performed two dances. 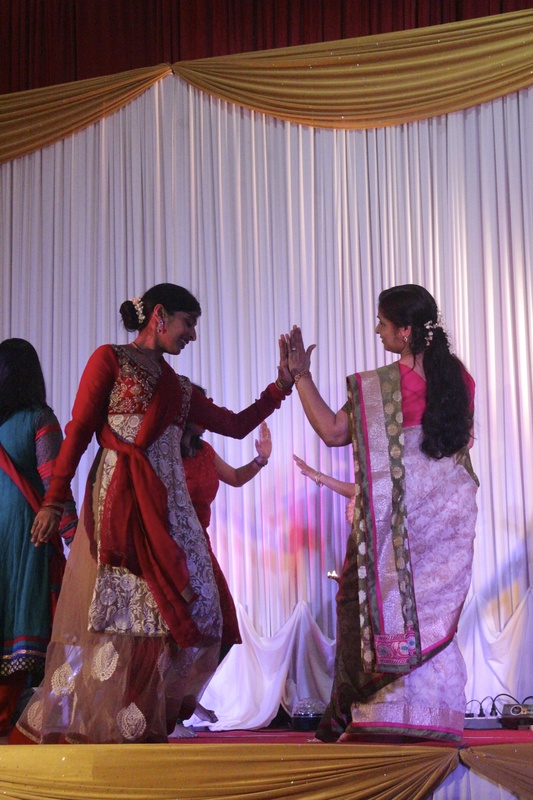 The bride and her mum performing a dance. 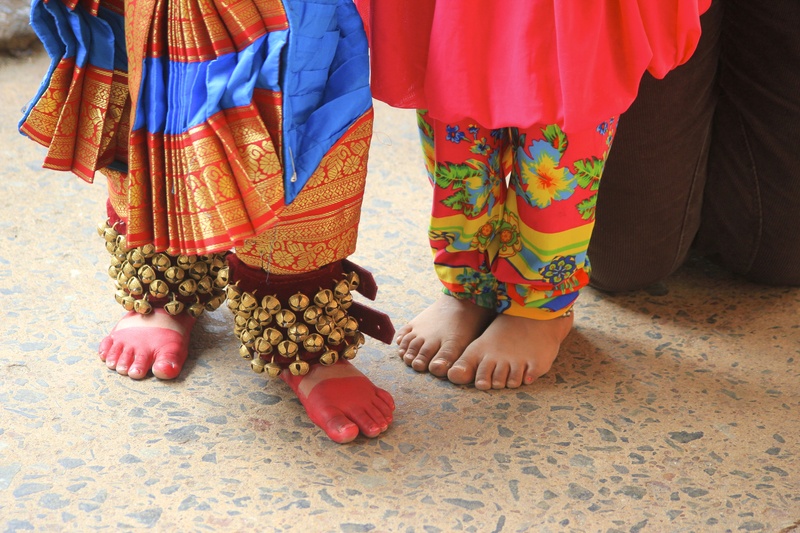 Then all of a sudden the groom was gone with his friends and the women lined up to have the mehendi put on them by three ladies who had especially been hired for the occasion. These ladies were so creative and made up intricate designs in 5 minutes, no design looked the same. 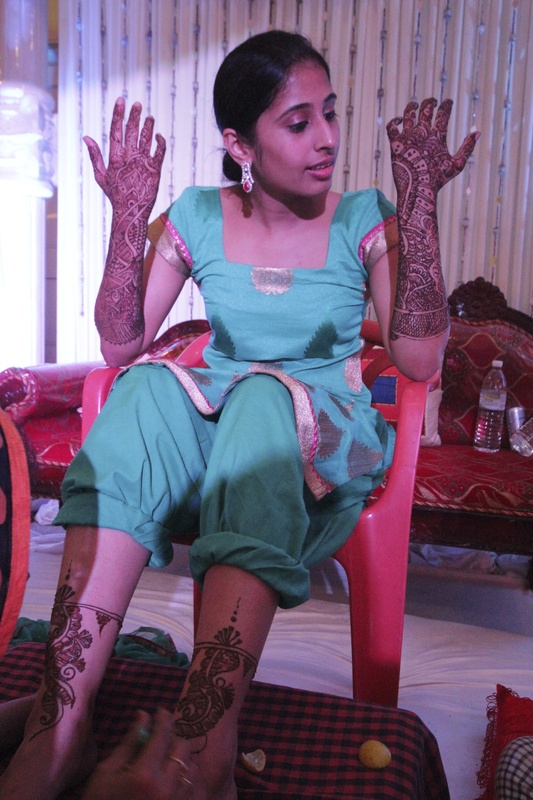 While this was going on, some people gave speeches and the bride’s eyes turned into waterfalls as she was having her hands and feet adorned with henna. The wedding was very small as the bride told me – only 600 people. 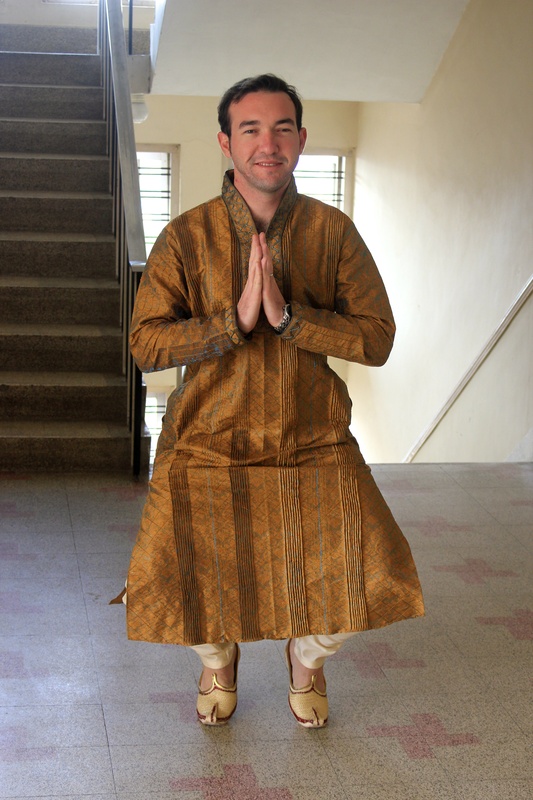 David dressed in a kurta and jhooti shoes while I was dressed by two ladies in my sari. Apparently very few of the younger generation girls know how to put on a sari, so being dressed by drapers before a wedding is a pretty standard thing. We tried our best to look Indian, but it felt like we were a bit of a curiosity attracting lots of friendly looks and posing for people while they took photos of us with their phones. The wedding was held at a conference centre and we were all seated in an auditorium. 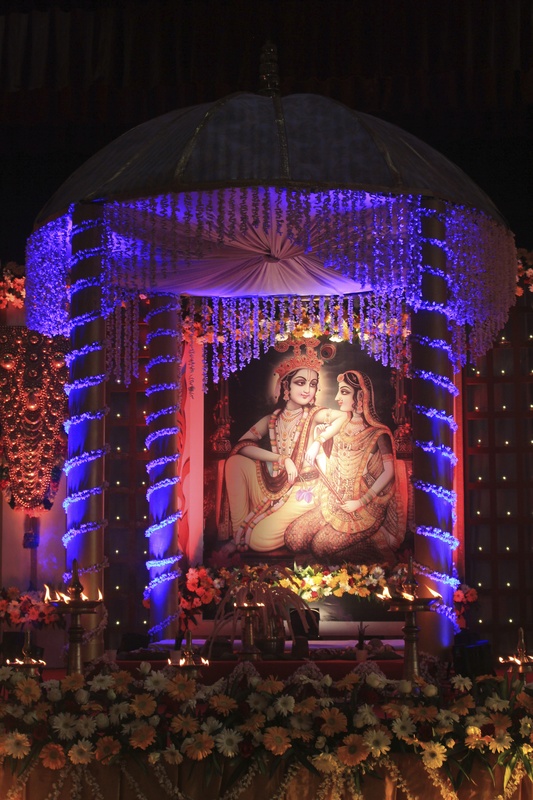 The stage was adorned with fresh flowers and lights and in the middle of it stood something like an altar with cushions and a bucket of rice in the middle. At first the bride’s parents poured some rice into a special rice bucket and lit some lights. Then the groom made his entrance, guided by the female members of both families. He sat down on one of the cushions, smiling nervously for the photographers, and then the female members of the family went to get the bride. As soon as the bride entered the room the amount of photographers doubled and people were gasping as she looked stunning. She was decorated with golden jewellery, henna and flowers and when she reached the stage her father gave her away after some rituals which we could not very clearly see as the photographers around them were going crazy for the perfect picture. Close members of family were on the stage too. At one point they all started giving the bride and groom spoonfuls of mashed banana mixed with milk. I later found out it had not been very tasty. 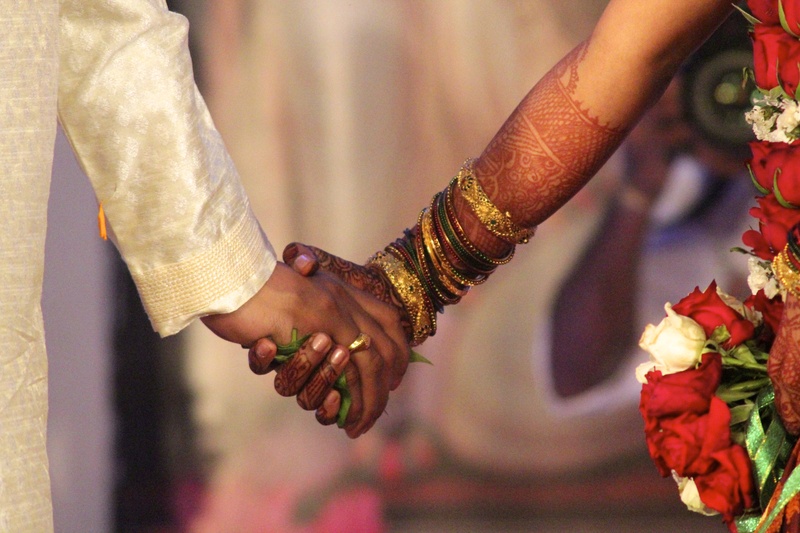 They don’t traditionally use wedding rings, but instead a type of necklace is used. 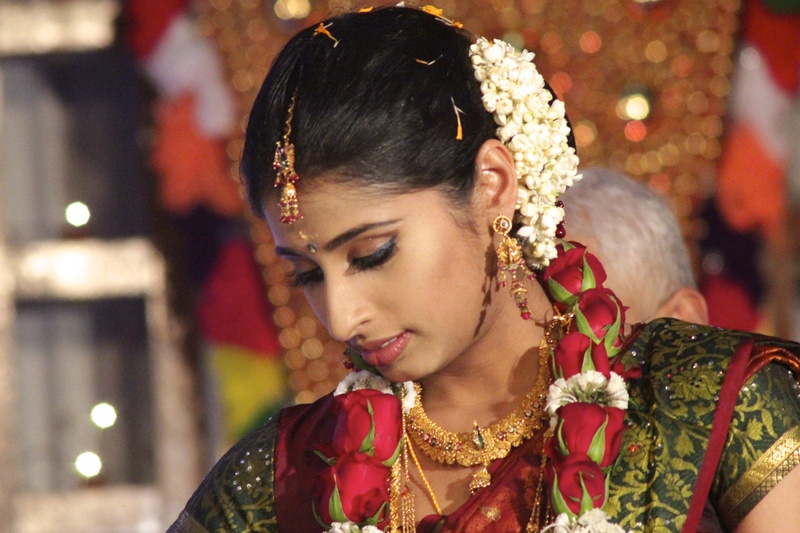 So the groom put this necklace on the bride and also put some red powder on her forehead, to signify that she is now a married woman. The groom also gave the bride a sari that she should wear when she first visits his parents’ house as his wife. The bride and the groom then got up and walked around the altar a few times, then applause sounded and they were married. 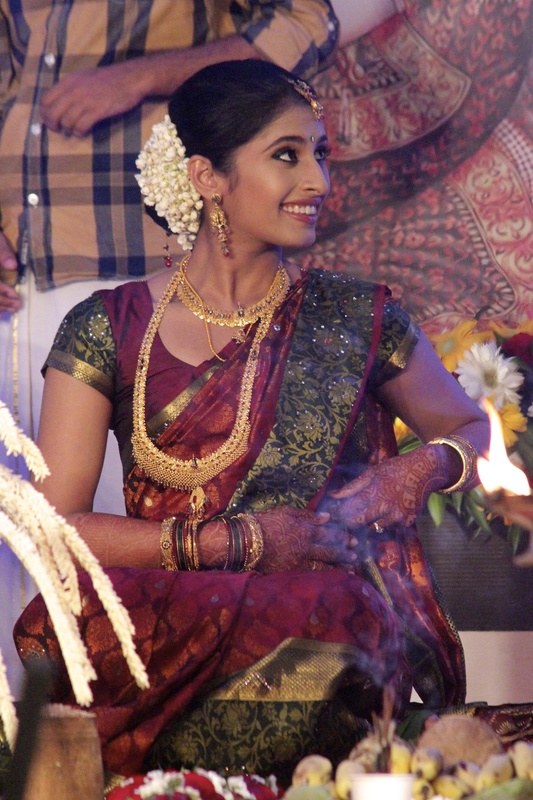 The whole ceremony took about 30 minutes, after which everyone headed to the dining area, which was laid out in rows of tables all set with thali, which is a typical Keralan way of serving food on a banana leaf. We all sat down in front of our banana leaf, where we had some vegetables, tamarind paste, dal and banana chips and then a hoard of waiters came with large bowls of rice and buckets of sambar, which is essentially a thin vegetable curry, and laid it all on our banana leaf next to what was already there. There are no utensils, so we ate with our hands, which I somehow find makes the food taste even better. Then three cups were laid in front of us and filled with desserts, which were sweetened tapioca and lentils I believe, but I am not sure. The lunch was over within 30 minutes, after which we took some photos and headed back to our hotel. The celebrations were over for now, but the family still had another function, where the bride would we welcomed into the groom’s house. 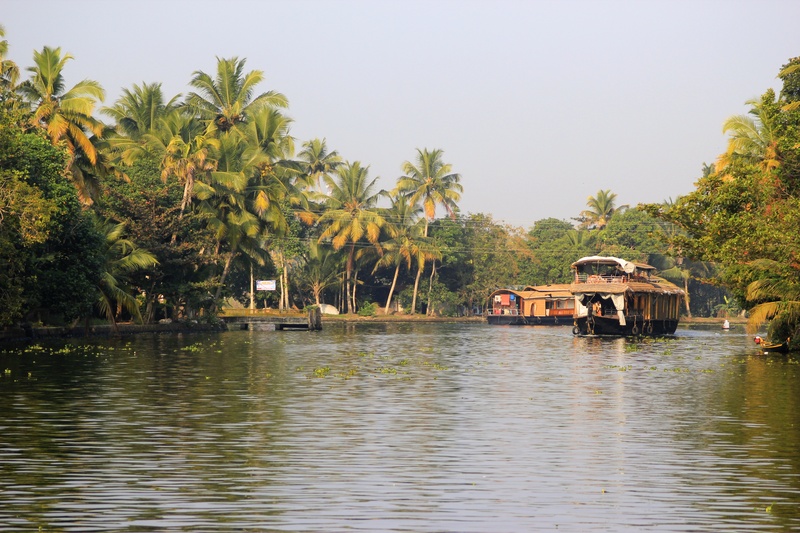 After the wedding we still had a couple of days left in Kerala, so we did what must not be left undone while in Kerala – spend a day and night on a houseboat on the Keralan backwaters. 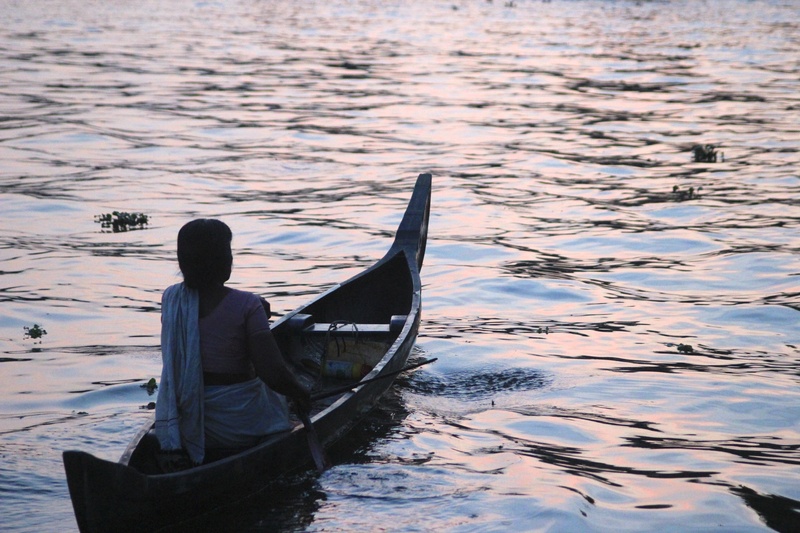 The backwaters of Kerala are an intricate system of lakes and canals, which were and are still being used to transport goods. The boats used now for transporting tourists were once used as rice barges. 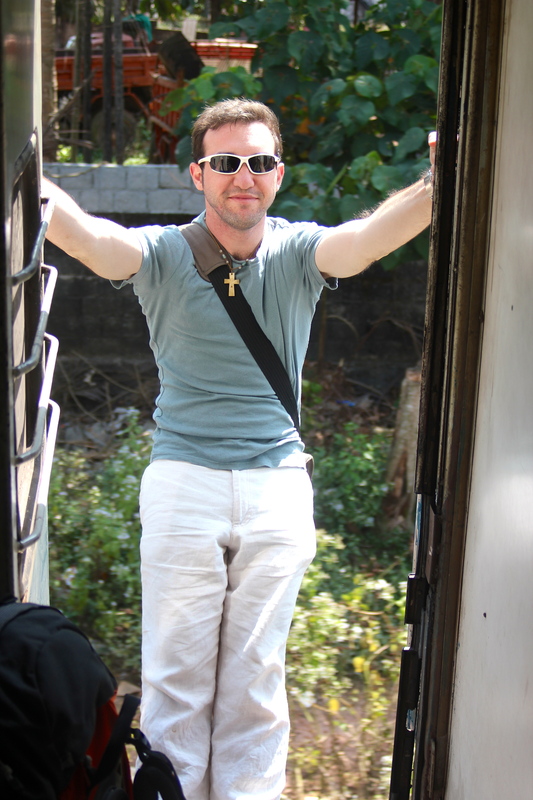 We took a train from Thrissur to Kottayam, where the boat was waiting for us. The Great Indian Railway was very clean and comfortable and of course we did the expected thing and hung out from doors trying to be like locals. There were old men walking around with bottles of water and plenty of deep fried snacks for sale, which we of course sampled. We were welcomed on our boat by our captain, whose name was Jesu and the cook whose name was Jacob. As soon as we sat down a flower garland was put around our necks, a fresh coconut handed to us and fresh fruit laid out on the table. 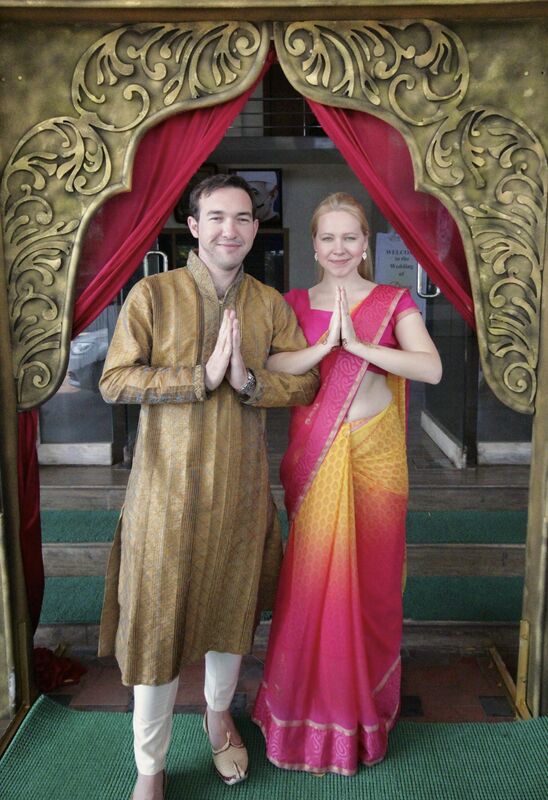 Needless to say we felt like Maharaja David and Maharani Katrin. 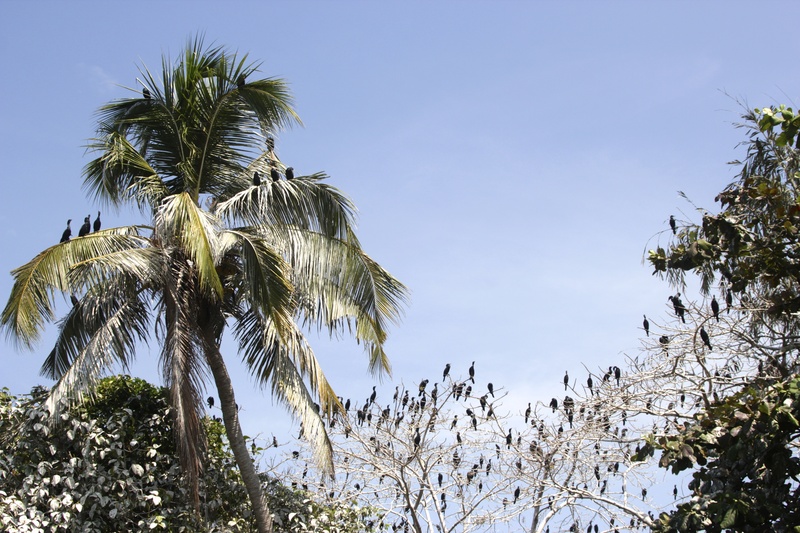 We started our ride around midday and passed thousands of birds and palmtrees. I had not felt that relaxed for months. We did absolutely nothing else but smile, sip coconut and admire the scenery. We stopped for lunch surrounded by paradise. 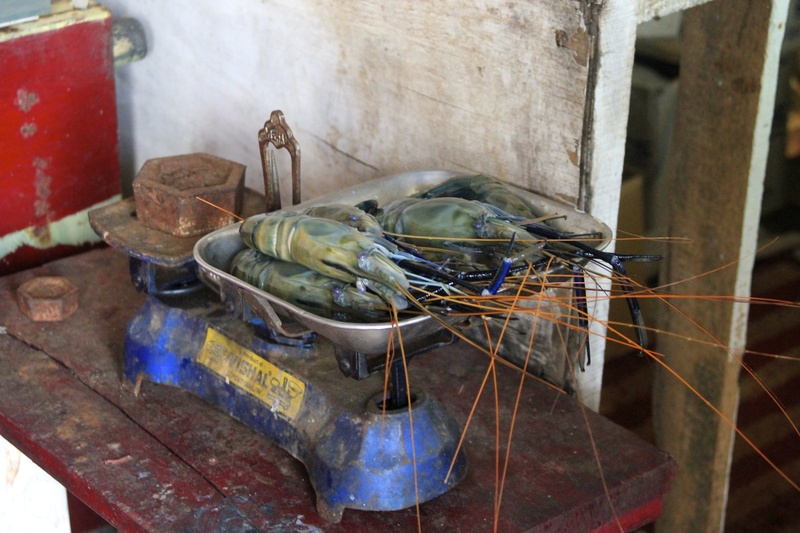 We lunched on freshly caught fish and various curries all flavoured with coconut. After lunch I fell asleep out on the deck in the shadow of a palm leaf. We soon set off again, going past large rice paddies and little villages. We were so well looked after by Jesu and Jacob at all times. Jacob cooked us some fried sweet bananas and tea and we continued to feel like royalty. We stopped near a little fishing village for the night. After buying some tiger prawns from a local fisherman we went for a walk in this village, saw the sunset from there and then headed back to feast on tiger prawns and chicken. 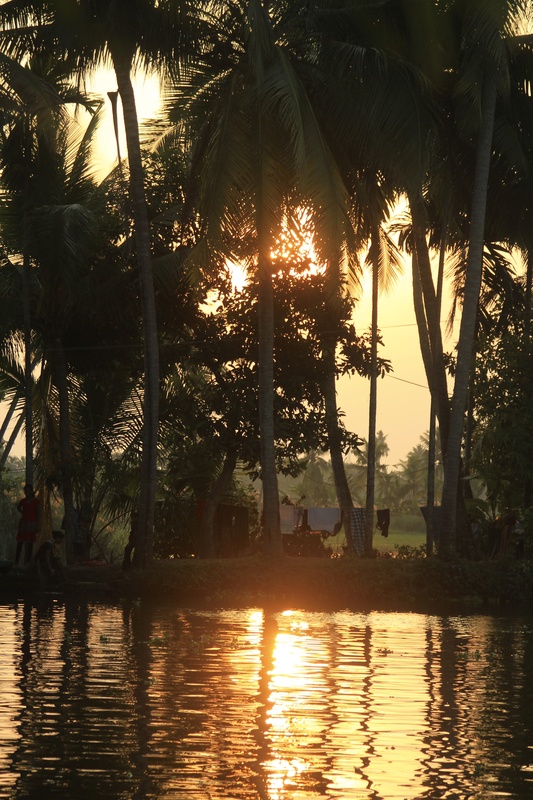 It was pitch dark as soon as the sun set, all we could see were lights on little fishing boats and all we could hear were splashes of water from people washing the dishes in the river and fish jumping around. 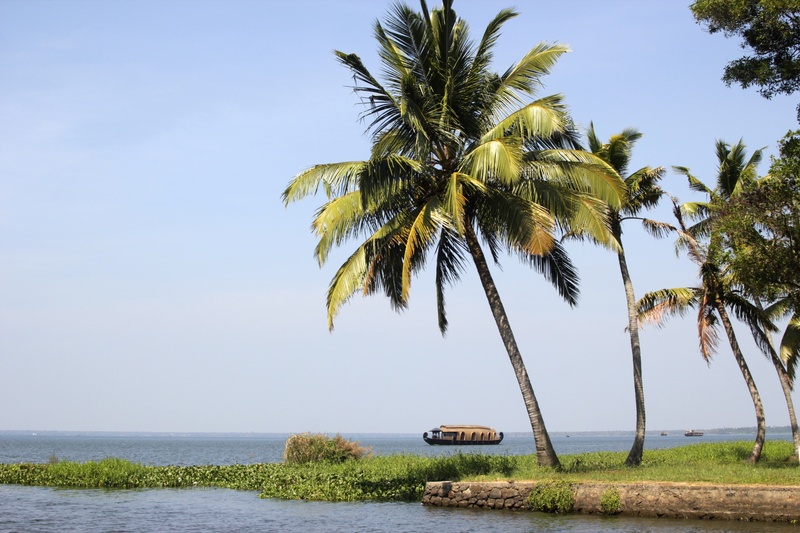 We woke up to see the sunrise at around 7 o’clock, had a breakfast of coconut pancakes and fresh fruit and by 9 o’clock we arrived in Alleppey, from where we took a taxi to the airport. Our plan is to return to the houseboat sometime, but this time with a small group of friends and for longer. 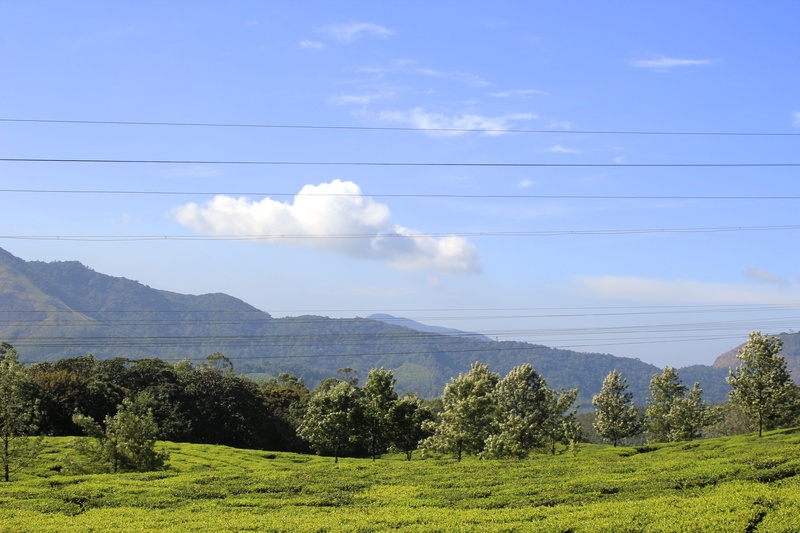 It has most definitely been the number one relaxing experience in India so far. We are now in Delhi and are heading to Jaipur and Agra on Monday. More on that when I have some time, but for now we are off to explore more of Delhi. 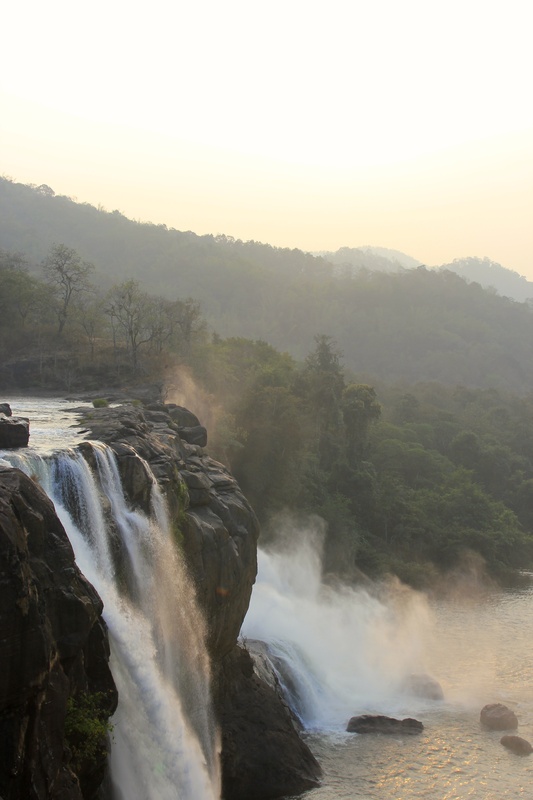 Posted in India, Malaysia, PlacesTagged coconut, Delhi, Eravikulam National Park, India, Indian wedding, Kerala, Kerala backwaters, Kuala Lumpur, Malaysia, Malyalam, Munnar, Nilgiri Tahr, south India, Thrissur, TravellingBookmark the permalink. It gives me an immense pleasure to read an article on my village by a foreign author. 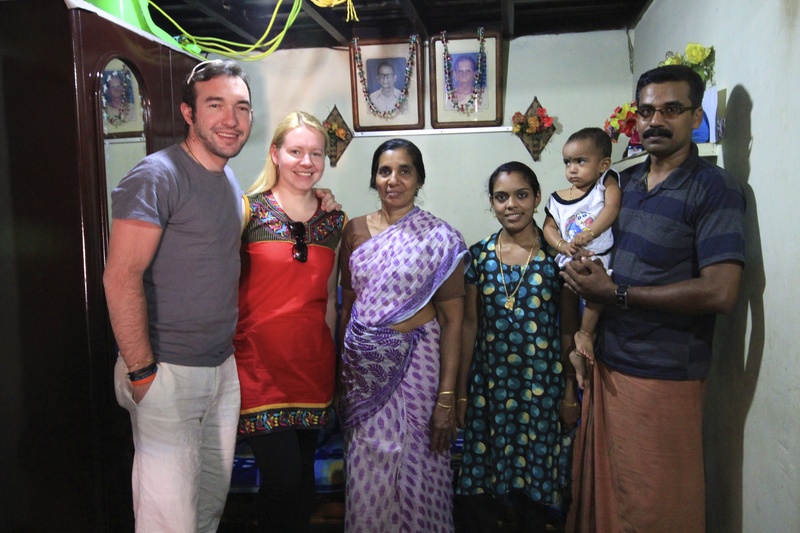 I’m so happy to learn that your Kerala experience was pleasant. I thank you for letting the world know of our people. Please come back to Thrissur. You are welcome anytime! Thank you for your kind words. 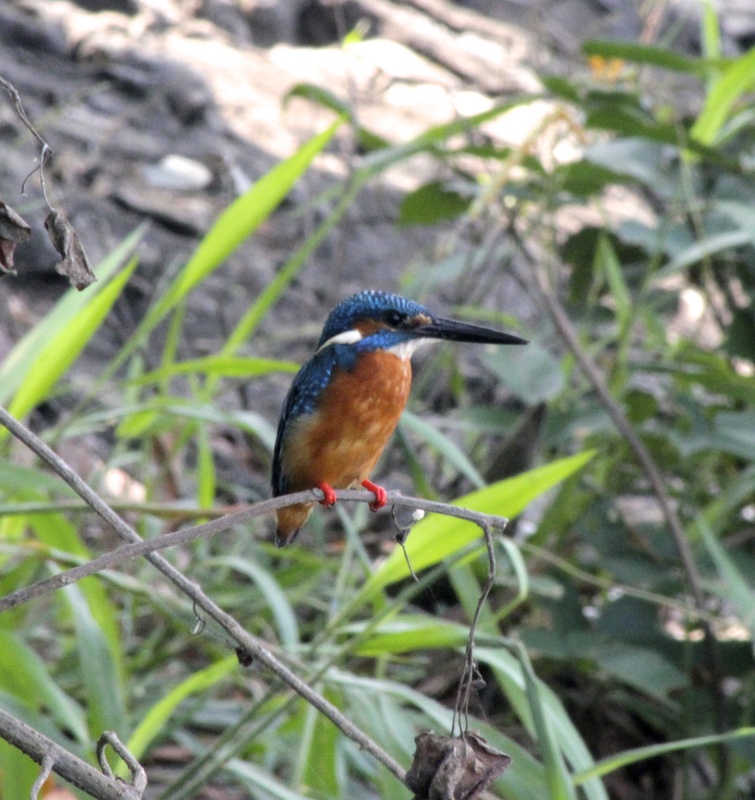 I loved Kerala and Thrissur and will definitely go back there one day. By the way, can I ask how you found my blog?